Renewal by Andersen of Northeast PA is confident your new windows and doors will provide the comfort and energy efficiency you need. To ensure continued operation and lasting beauty for years to come, we recommend that you follow these maintenance guidelines. Routinely clean dirt and other debris from the sills and tracks to ensure windows and doors continue to operate smoothly. To clean the window frame, sash and grilles, use a soft rag or brush and a solution of mild soap and water. To clean glass, first wipe away dirt and debris with a soft cloth. Apply a cleaning solution of mild soap and water or glass cleaning spray, wiping in a circular motion. Remove the solution with a dry, lint-free cloth. Do not clean glass with abrasive cleaners or acid solutions. Do not use newspaper to dry glass as the ink could discolor Fibrex® frame material. Clean insect screens, including TruScene® insect screens, with a soft cloth. Use a dry lubricant to lubricate all moving parts on windows and patio doors, including locks, hinges, operators and rollers. Never use wet lubricant or harsh abrasive cleaners that will attract dirt and other corrosive materials. Applying screws into the window or sash frame or otherwise modifying a window or door after installation will void the limited warranty. Wash window and door hardware using mild detergent and a soft cloth. Avoid abrasive cleaners, cloths or brushes that could scratch the hardware surface. If you choose to paint Fibrex® window frames, be careful not to paint weatherstripping, gaskets or any surface that slides along another surface. Use of stains on Fibrex® is not recommended. 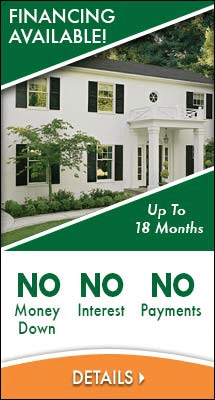 Renewal by Andersen of Northeast PA would be happy to show you a different approach to window installation and service. Call (610) 355-4055 today to schedule your free in-home consultation for windows or replacement doors in Scranton and many other surrounding communities!